To understand how organizations today are striving to create ethical organizations, Professor Molina presents case studies of four health care organizations. To understand how organizations today are striving to create ethical organizations, Professor Molina presents case studies of four health care organizations—Cleveland Clinic, Mayo Clinic, Veterans Health Administration (Department of Veterans Affairs), and the Military Health System (Department of Defense—and describes how each is managing organizational integrity risks. The case studies highlight lessons learned and best practices from each of the organizations examined. 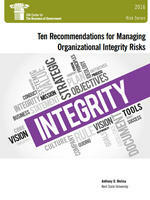 Based on the four case studies, as well as the author’s research on the subject, Professor Molina sets forth 10 recommendations on how public managers can better handle organizational risk integrity. A key recommendation involves the need for all organizations to effectively balance their emphasis on rules and sanctions (also known as compliance-based tools) and values-based tools which focus on organizational culture. The recommendations are clearly applicable to government, as well as to organizations in the private and nonprofit sectors. This report serves as an excellent companion piece to recent IBM Center reports which examined other aspects of risk management that can help government agencies. In his report Managing Risk, Improving Results: Lessons from Improving Government Management from GAO’s High-Risk List, Donald Kettl examines the types of risk identified by the Government Accountability Office and how agencies can more effectively guard against such risks. In their report Improving Government Decision Making through Enterprise Risk Management, Douglas W. Webster and Thomas H Stanton discuss how agencies can more effectively deploy and use an enterprise risk management approach.